Southwestern Illinois College's Precision Machining Technology (PMT) program prepares students with the skills and experience needed to enter a variety of machining fields. More than 90 percent of students who complete the PMT program are said to secure full–time employment in the industry within six months of graduation. They typically secure jobs as general machinists, toolmakers, CNC operators, CNC programmers, maintenance machinists, inspectors, or CAD/CAM programmers. The College won the Clips & Clamps Industries Educational Institution Award for its efforts in developing the program. Photo courtesy of Southwestern Illinois College/PMA. The companies were joined by Southwestern Illinois College as winners of awards that celebrate high achievement in areas like product development, innovation and technology, and training and education. At the FABTECH tradeshow in Chicago, Illinois, last fall, three manufacturing companies and an institution of higher education were honored as winners of the Precision Metalforming Association's (PMA) Awards of Excellence in Metalforming. The awards program annually recognizes high standards of achievement by honoring top performers in areas such as design, safety, quality, innovation and technology, training and education, process control, product development, and productivity. All four winners received a special plaque, commemorative flag, and a cash prize. The winning entrants were Anchor Manufacturing Group, Inc. (Cleveland, Ohio), winner of the Zierick Manufacturing Corporation Productivity Award; Hatch Stamping Company (Chelsea, Michigan), winner of the Plex Systems Innovation and Technology Award; and Metal Flow Corporation (Holland, Michigan), winner of the Ulbrich Award for Competitive Excellence in Product Development. In addition, Southwestern Illinois College (Granite City, lllinois) won the Clips & Clamps Industries Educational Institution Award. The Precision Metalforming Association is a trade association that represents North America's metalforming industry, which creates a wide range of precision metal products via manufacturing processes such as stamping, fabricating, spinning, slide forming, and roll forming. Its nearly 800 member companies include suppliers of equipment, materials, and services to the industry. Following are summaries of the accomplishments that were recognized as winners by the Precision Metalforming Association. 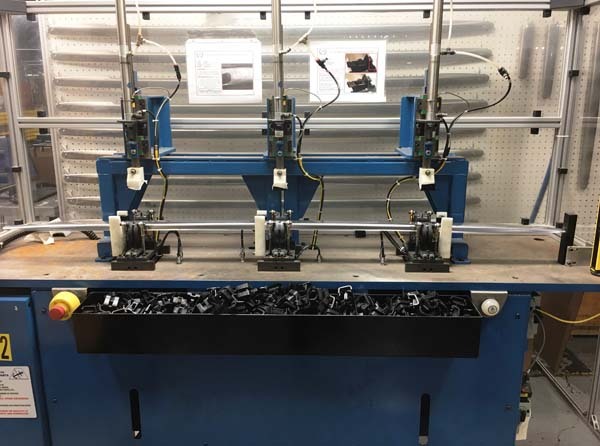 Anchor Manufacturing won the Zierick Manufacturing Corporation Productivity Award for its approach and handling of a class–A part, an automotive side–sill that needed to maintain critical appearance standards. Photo courtesy of Anchor Manufacturing/PMA. Anchor Manufacturing Group, Inc., of Cleveland, Ohio, took home the Zierick Manufacturing Corporation Productivity Award. The company produces stampings and assemblies for a variety of industries, and has put a significant amount of focus on class–A–appearance trim parts as one of its core areas of expertise. Anchor Manufacturing won the award for its approach and handling of a class–A part, an automotive side–sill. The side–sill appearance part presented many challenges from the onset of the project, due to the need to maintain critical appearance standards. The first major issue involved scratches. The repeating location of the scratches made it apparent that the parts became scratched during transit to the customer. Anchor then developed two new packaging concepts to eliminate scratching. A second issue was related to inspector agreement–internally, between Anchor's own inspectors, and between Anchor's inspectors and its customer's inspectors. A Kappa study was performed to evaluate how the inspectors' inspection of parts compared to one another, as well as to the process expert. With regard to the inspector agreement, the team determined it to be critical that both parties view the parts in the same environment. As a result, Anchor built a part stand that placed the part in field position and then determined the customer–specified distance for viewing the part. Anchor placed lines on its plant floor to properly locate the part stand and the inspection distance. Then, it investigated the customer–specified lighting under which the parts needed to be inspected. Anchor modified the lighting both at its inspection table and at its part stand to meet the specification. The final issue experienced during the project involved a part surface blemish that turned out to be residue from the adhesive on the protective film that was applied to the part before shipment. It was determined that the parts were sitting too long when Anchor was ahead of schedule, which resulted in adhesive residue on the parts. After trialing other protective films, Anchor found one that left no residue and also saved cost for the company. As a result of these measures, Anchor is reported to have experienced an annual saving of $150,000 from scrap reductions, productivity increases, and on–time delivery. The scrap rate decreased from three to 0.5 percent. In addition, the customer could now expect 100 percent on–time delivery and 100 percent quality parts. The Productivity Award is one of nine Awards of Excellence in Metalforming that are presented annually by PMA. Sponsored by Zierick Manufacturing Corp., Mount Kisco, New York, the award recognizes outstanding achievement by a manufacturing company in the development and implementation of programs, processes, and use of assets that lead to significant improvements in productivity. Hatch Stamping Company, of Chelsea, Mich., earned the Plex Systems Innovation and Technology Award for implementing cloud technology and an enterprise–resource–planning (ERP) system. 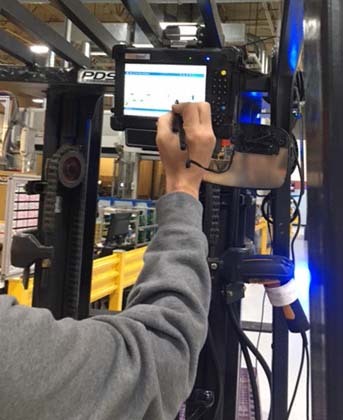 The system drives continuous real–time data collection to effectively manage core business functions across Hatch's multi–facility organization. Benefits from implementing the system include the ability to see the current real–time status of customer program timing, to hyperlink to complete details of every program with a few clicks of the mouse, and to navigate to multi–linked facilities. It also helps the company significantly reduce waste and variation. Photo courtesy of Hatch Stamping/PMA. Hatch Stamping Company, of Chelsea, Michigan, received the Plex Systems Innovation and Technology Award. Founded in 1952, the company is a major producer of highly engineered metal stampings and assemblies for the automotive industry. Hatch Stamping won the award for implementing cloud technology and an enterprise–resource–planning (ERP) system that drives continuous real–time data collection to effectively manage core business functions across its multi–facility organization. The system also helps the company significantly reduce waste and variation. Utilizing the system's enhanced program–management tool allows Hatch Stamping to quickly review its more than 275 projects at a glance, understand where the company's Gates timing is, hold teams accountable, and ensure that customer requirements are met. The ability for customers and suppliers to access and view project information has allowed Hatch Stamping to manage the increased project workload without needing to increase internal administrative staff. In the past, staff spent countless hours building out manual spreadsheets, redundant forms, and task lists in attempts to manage supplier deliverables and customer requirements. The company also holds its suppliers to its Gantt timelines and creates user accounts for them to manage the deliverables timely on the project gates that the suppliers have with Hatch Stamping. Customers now are confident that Hatch Stamping is on target to meet their timing deadlines. The proof is in the data. These engineering software tools are integrated with the enterprise resource planning (ERP) system to ensure efficient tracking of a project from launch to production, maintaining performance 100 percent within budget and on–time. Hatch Stamping and its employees are reported to have experienced numerous benefits from implementing the ERP system, including the ability to see the current real–time status of customer program timing, to hyperlink to complete details of every program with a few clicks of the mouse, and to navigate to multi–linked facilities. In addition, a unified menu structure enables everyone to access what they need in the same fashion, and all employees can access the system on their mobile and portable devices through Google Apps or iTunes. The Innovation and Technology Award recognizes a metalforming company that has implemented cloud technology to drive innovation from a product or business perspective, transform business operations, or leverage it in order to scale and grow from a size or product perspective, and emerge as a leader in their industry. The award is sponsored by Plex Systems, Inc., Troy, Michigan. Metal Flow Corporation, located in Holland, Michigan, received the Ulbrich Award for Excellence in Product Development. The company earned the award for developing a deep–draw–stamping alternative to a costlier machining process when producing automobile fuel–system assemblies. Metal Flow Corporation is a contract manufacturer specializing in deep–drawn automotive parts. Metal Flow identified an opportunity in the fuel–system industry, specifically related to the trend of higher pressure gasoline–direct–inject (GDI) applications. Gasoline direct–inject technology is said to be present on nearly 85 percent of light–vehicle gasoline power plants globally. 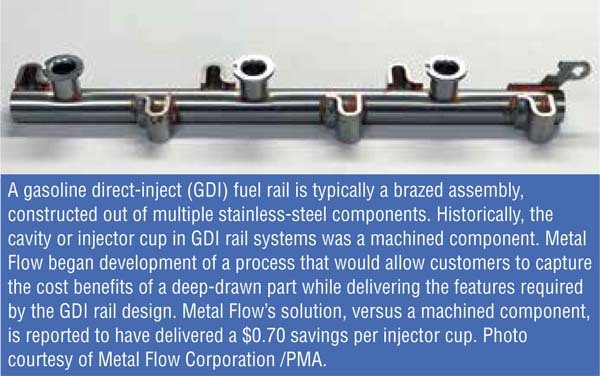 A GDI fuel rail typically is a brazed assembly, constructed out of multiple stainless–steel components. This assembly delivers high–pressure fuel to the injectors. Each injector requires a tight tolerance cavity, which interfaces with the injector seal and must have a calibrated surface finish, with the interface diameter controlled statistically to 50 microns. Historically, the cavity or injector cup in GDI rail systems was a machined component. Metal Flow began development of a process that would allow customers to capture the cost benefits of a deep–drawn part while delivering the features required by the GDI rail design. This proprietary deep–draw, anneal–and–burnish process utilizes two high–speed stamping operations with an intermediate anneal process to yield a finished component. Metal Flow discovered that without the intermediate anneal process, the dimensional creep during the final braze process on a simple deep–drawn component created final assembly issues at its customer. A collateral benefit of the high–speed burnish step was superior surface finish and consistent cavity definition, enhancing the dimensional integrity of the deep–drawn solution. Metal Flow's solution, versus a machined component, is reported to have delivered a staggering $0.70 savings per injector cup. Depending on the engine/rail configuration (in–line 4, V6, or V8), the savings per engine are reported to range from $3 to $5. Along with delivering these quantifiable savings on the piece–price level, the deep–drawn solution, by nature of the process, also eliminates the porosity–failure mode, which is typical in a machined solution. Metal Flow currently supplies multiple configurations of these injector cups, with annual volumes of greater than 5,000,000 pieces. The Product Development Award is sponsored by Ulbrich Stainless Steels and Special Metals, Inc., of North Haven, Connecticut. It acknowledges a manufacturing company that demonstrates outstanding innovation in developing and manufacturing a product that best uses metal in place of a nonmetal competitive material, or that develops a product using flat–rolled material that was previously manufactured using more costly manufacturing processes. Southwestern Illinois College (SWIC), of Granite City, Illinois, garnered the Clips & Clamps Industries Educational Institution Award for its outstanding Precision Machining Technology (PMT) program, which prepares students with the skills and experience needed to enter a variety of machining fields. Southwestern Illinois College has invested heavily in state–of–the–art computer labs, manual equipment, CNC machines, and quality–control equipment for teaching its students. During the course of instruction, students experience approximately four hours of hands–on practical application and one hour in theory. The college offers a two–year associate degree in applied science and a one–year certificate of technology in precision machining. Additional certificates are available in CNC machining, advanced CNC machining, Mastercam, and SolidWorks. The Precision Machining Technology program has been accredited by the National Institute for Metalworking Skills (NIMS) since 2009, and, thus far, more than 1,500 NIMS credentials have been awarded to 260 students. The college effectively markets its PMT program by regularly visiting area high schools. This effort is led by Mark Bosworth, department head and coordinator of the college's industry technology programs. His efforts include conducting summer training sessions for high school instructors, repairing equipment in the high schools, channeling donated equipment and supplies from industry partners to high schools, and arranging tours of modern manufacturing plants for high school students. He also established dual–credit opportunities for students to enroll in two of SWIC's PMT courses while still in high school, and to receive college credits for the courses. The largest marketing event for the college's industrial programs is National Manufacturing Day, when SWIC invites high schools to attend tours of manufacturing plants and machine shops, as well as attend an open house at SWIC's Granite City campus, which includes displays from employers and tours of the technical departments. The event has grown to include more than 1,200 students, and the result of this effort is increased enrollment in the college's PMT program. The school's efforts have been successful in many ways. 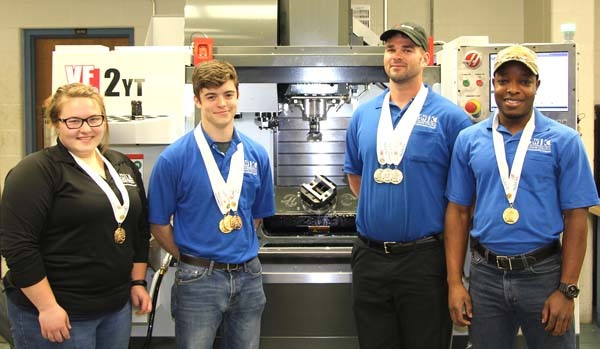 Students were recognized at the SkillsUSA competition, taking first place among Illinois students in CNC milling, CNC turning, CNC technician, and automated manufacturing in the state of Illinois. Also, students who complete the PMT program typically secure jobs as general machinists, toolmakers, CNC operators, CNC programmers, maintenance machinists, inspectors, or CAD/CAM programmers. More than 90 percent of students are said to secure full–time employment in the industry within six months of graduation. The Educational Institution Award recognizes a public or private educational institution that provides outstanding training and education services to companies in the metalforming industry. The award is sponsored by Clips & Clamps Industries, Plymouth, Michigan, and funded by the Dul Foundation.